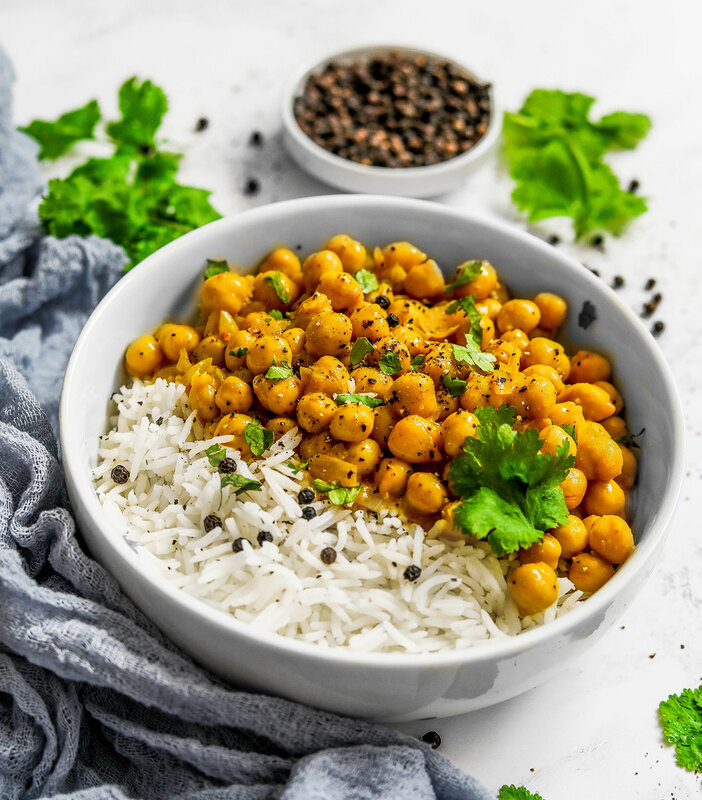 For me, meals like this easy coconut chickpea curry are such a huge time saver on a busy day. Come evening time I don’t usually have the energy to cook, especially if I’ve been recipe creating or filming earlier that day followed by cleaning and tidying. It can really take it out of me. 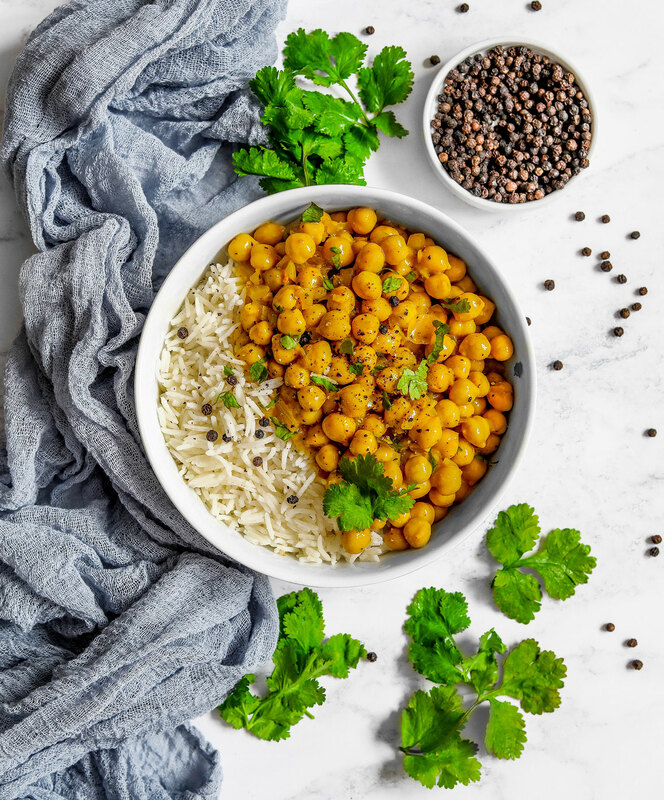 So I always fall back on quick and easy recipes like this one that doesn’t require much time to prepare and uses ingredients I always have available in my pantry. 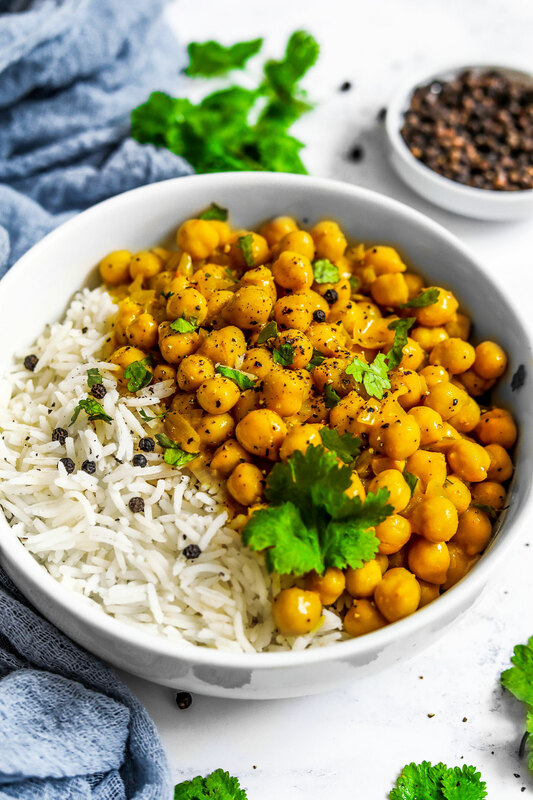 Ingredients like canned chickpeas, canned coconut milk, spices and rice. I use light coconut milk to make it slightly healthier and lighter. The great thing about this curry is that you can adapt it to your taste. If you don’t like chilli, leave it out. If you fancy adding cinnamon, go ahead! You can serve it with brown rice, quinoa or buckwheat to make it even healthier, or you can ever serve it with bread if you don’t have time to make rice. 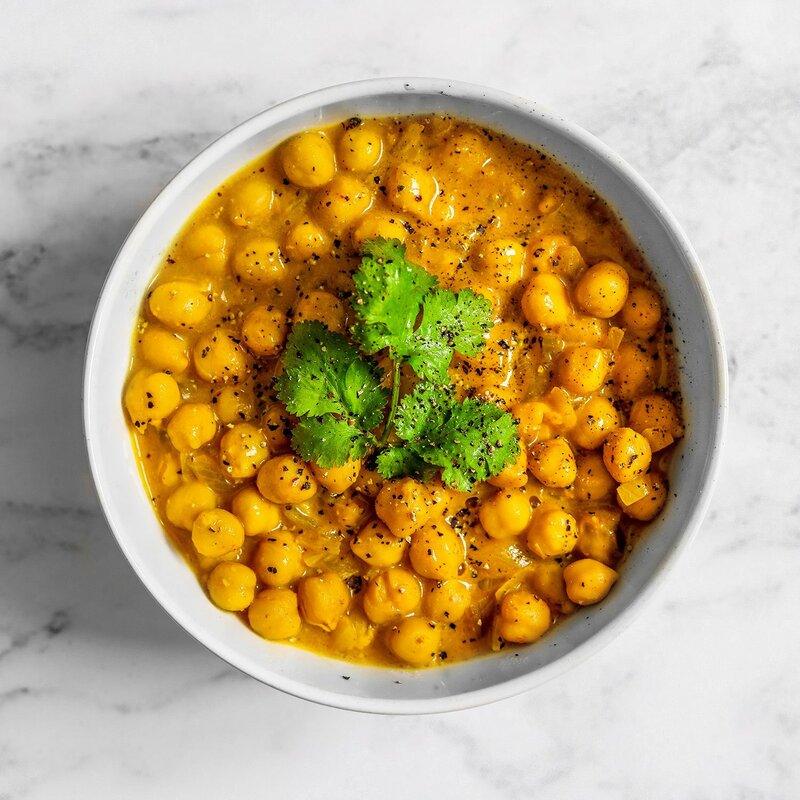 If you want more plant-based curry inspiration, check out my pumpkin, cauliflower and lentil curry. Heat 1 tbsp of oil in a large skillet and sautee the onions on a medium heat for 5 minutes. Add the crushed garlic, turmeric, cumin, chilli and coriander as well as a splash of water to create a paste. Add the chickpeas, coconut milk, lemon juice and maple syrup. Cover and bring to a quick boil, then lower the heat and leave to simmer for 5-10 minutes. Season to taste with salt and pepper and serve with boiled rice and fresh coriander. I love coconut curries! Anything with lots of chickpeas, carrots, green beans, eggplant, onions, bell peppers, and kabocha squash are my absolute faves. 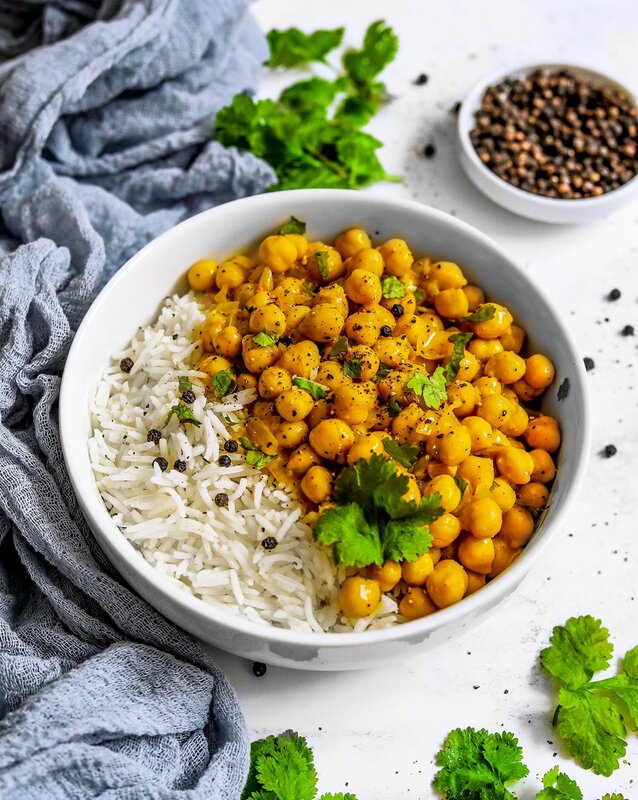 I need to start meal-prepping curries once again–though the beautiful fumes of the spices might tempt me to eat more than one portion in one day! Could you freeze this curry? I like cooking in batches and this recipe looks delicious! It tasted amazing and the maple syrup didn’t ruin it at all 🙂 You can use sugar or leave out the sweetener if you prefer not to use it. Fantastic! This is my new go-to recipe!